A 24-year-old male patient from Africa (Tanzania) was referred from an otorhinolaryngologist in March 2016 for the evaluation of a suspected autoimmune condition with laryngeal stenosis. He complained of joint pains, morning stiffness lasting for >30 min, episodic, recurrent ear lobe pain, and chest pain. On examining the patient, we found that he had auricular chondritis, keratoconus, and synovitis of proximal interphalangeal joints. The patient shared no significant family history. He was seronegative for rheumatoid factor and antineutrophil cytoplasmic antibodies but had elevated erythrocyte sedimentation rate (ESR) of 82 mm/h. After ruling out Behcet's, vasculitis, and other autoimmune conditions, a provisional diagnosis of relapsing polychondritis (RP) was made as per the McAdam's empirical diagnostic criteria. The patient was then prescribed with the course of medication [Figure 1] and advised to send monthly laboratory test reports through mail for monitoring. In September 2016, he was referred to an ENT surgeon for laryngeal stent removal. As the patient still showed elevated ESR (77 mm/h), he escalated the dose of methotrexate to 20 mg weekly once. Even 4 weeks after the escalated methotrexate therapy, we could not see improvement in his condition. Hence, in October 2016, we added biologic therapy (biosimilar adalimumab 40 mg every other week [EOW] subcutaneous injection for 3 months) to his treatment. Before starting the biosimilar adalimumab therapy, the patient was promptly screened for tuberculosis, hepatitis B, hepatitis C, and human immunodeficiency virus infections, malignancy, heart failure, as well as for anemia and found negative. Within 2 months (December 2016) after the initiation of biosimilar adalimumab, there was a decrease in the ESR (52 mm/h). During the next follow-up (March 2017), we found that the patient has shown good improvement while on biosimilar adalimumab but had a flare upon discontinuation after the 3 months. 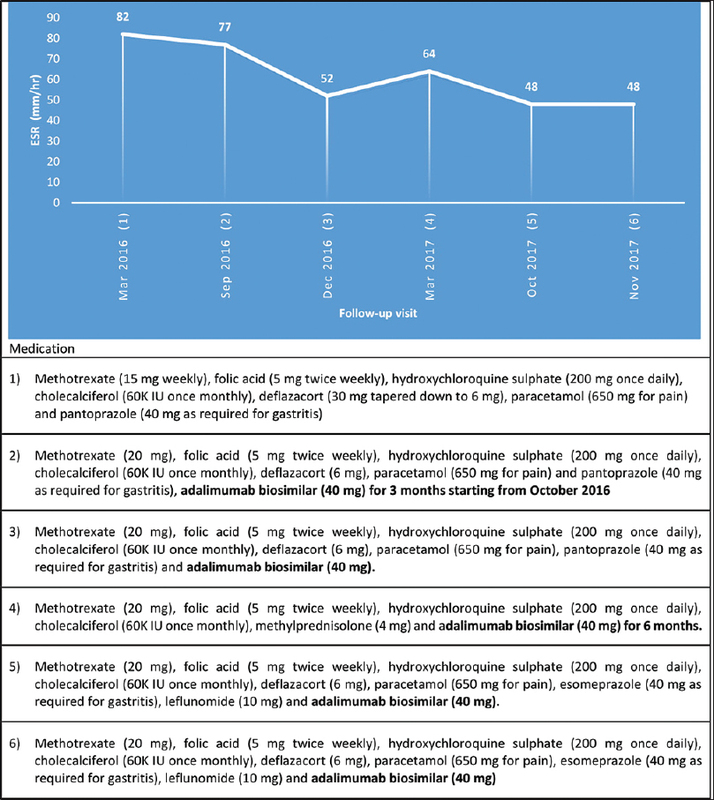 As his ESR has come down to 64 mm/h, we advised him to continue biosimilar adalimumab (40 mg EOW) for another 6 months (to stop if any infections) and monitored via bimonthly laboratory test reports. There are no conventional guidelines for the management of RP that have been validated to date. Corticosteroids are unanimous in the management of RP. At conditions where corticosteroids are not appropriate, immunosuppressive or immunomodulatory drugs are indicated. The autoimmune nature of the disease and refractory cases to the conventional immunosuppressive agents justifies the role of biological therapies in treating RP. Among the biologics studied in refractory RP cases, adalimumab was reported to have the highest persistence – suggesting good risk–benefit ratio, and achieved prolonged response. Adalimumab blocks the actions of tumor necrosis factor α, which plays a role in the induction and production of matrix-degrading proteinases from chondrocytes. Thus, we hopefully used biosimilar adalimumab, and to our belief, this patient has shown good improvement as well as had no new adverse signals. We conclude that, to the best of our knowledge, this is the first case of RP complicated with laryngeal stenosis that has been successfully controlled with biosimilar adalimumab and we expect the need of long-term studies with a larger sample to confirm our observation. McAdam LP, O'Hanlan MA, Bluestone R, Pearson CM. Relapsing polychondritis: Prospective study of 23 patients and a review of the literature. Medicine (Baltimore) 1976;55:193-215. Kingdon J, Roscamp J, Sangle S, D'Cruz D. Relapsing polychondritis: A clinical review for rheumatologists. Rheumatology (Oxford) 2018;57:1525-32. Lekpa FK, Chevalier X. Refractory relapsing polychondritis: Challenges and solutions. Open Access Rheumatol 2018;10:1-1. Moulis G, Pugnet G, Costedoat-Chalumeau N, Mathian A, Leroux G, Boutémy J, et al. Efficacy and safety of biologics in relapsing polychondritis: A French national multicentre study. Ann Rheum Dis 2018;77:1172-8. Seymour MW, Home DM, Williams RO, Allard SA. Prolonged response to anti-tumour necrosis factor treatment with adalimumab (Humira) in relapsing polychondritis complicated by aortitis. Rheumatology (Oxford) 2007;46:1738-9.